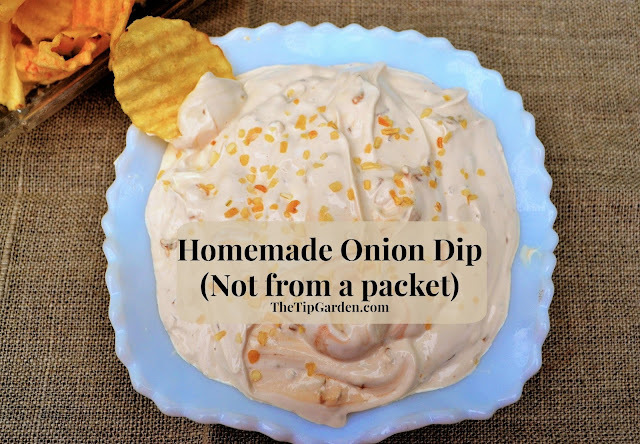 Homemade Onion Dip is a classic dip that is easy to throw together at the last minute, and is loved my most everyone. You do not need to rush to the store to buy a packet of onion soup mix! You can easily do this from scratch! In fact.. You don't ever need to buy another packet again! If you are one of my long time followers than you may already have my homemade onion soup mix recipe! I never buy those store bought packets of onion soup mix! too much salt, too many ingredients I can't pronounce, too much money! Most of us have the 4 ingredients on hand already, so lets just make a packet or two up and keep it in our cupboard for dip, or sprinkling on pot roast or cubed beef for kabobs, or .. onion dip for chips! Jan's Tip: Let the dip set in the fridge for an hour or more before serving, it will give the flavors time to "marinate" and develop and will just taste better if you make it ahead of time. Today lets just whip up a batch from scratch and make some dip! It is my go to dip for last minute company, a get together, or when we find ourselves watching a game! 16 oz. container sour cream. In a medium sized bowl blend together the first four dry ingredients. Add in the sour cream and stir till dry ingredients are well blended into sour cream. Cover and refrigerate till serving. We love onion dip. I've pinned yours to try. Thanks, Jan.